It is getting permission to send an email to a customer. We have a lot of permission systems in our industry typically in the form of Internet leads from third-party sources and our own websites. But, are you (or your third-party sources) informing the customer you will be marketing to them beyond that first price quote they requested? Are you sending a newsletter to your entire database? Are you sending promotional email blasts? Are you calling customers after 90 days who didn’t respond to one of your emails or submitted another fresh lead? Let’s forget the law for a minute, and just consider the ethics of this. I guess we say it is perfectly okay to send a bunch of stuff to anyone you have information on because everyone else does it…….right? According to reporting in iMakeNews, the national average for automotive newsletters opened is 17% and the national average for clicks (conversion) in your email is 5.1%. If you send one newsletter to 10,000 people that means 1,700 will actually open the email and you may convert 500 to visit your website. I’m not going to go into all the details of the conversion to a sale stats because I want to ask the question – What about the other 8,300 people who didn’t open your email? This has absolutely nothing to do with iMakeNews or any other email follow-up – it has everything to do with YOU! Do your customers even want to hear your message? I have come to the conclusion that dealers are desensitized to spam. We love it! And we think everyone else does too. Let’s send them a mailer, let’s send them an email to back-up the mailer, and let’s have all our salespeople call the customers who got the mailer and the email to make sure they received the mailer and the email! Recently, 3 of our manufacturers at my dealer group have asked us to do this around their own promotions. I don’t know about you, but if Best Buy sent me a piece of mail, an email, and called me about the same promotion for the weekend I would immediately have them remove all my information, and IF I continued to shop there, I would do it anonymously. I might be a little extreme in my mail, email, and call example but I hope it gets you thinking the next time you think of your direct-marketing campaign methods. We are in a world where the consumer has the choice. If you want to continue to be a choice you have to play by their rules. Make your messages consistent with your brand/image/reputation – don’t have a brand?…how did Obama build his brand quickly? Have a landing page on your website for the email campaign that entices the customer to move to other areas of your site. 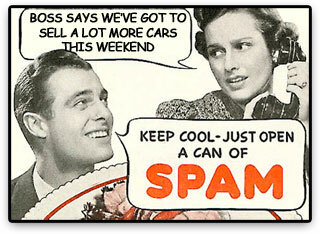 I’m guilty of all this spam-stuff myself. It has actually worked, but is it the best way to market your brand? What do you think? Got any other pointers?